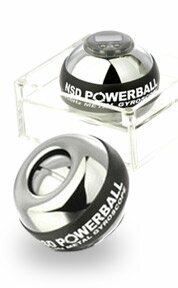 Techno is the very latest addition to the exciting family of Powerball products! This innovative gyroscope scrolls your achieved scoring 'magically' across the surface of the rotor (as opposed to on the digital speed meter like on the other models in the range). The rotor also displays an entrancing collection of 'firelines' as it spins, ranging from red to blue in color and giving an a truly amazing effect depending on the speed at which it is revolving. 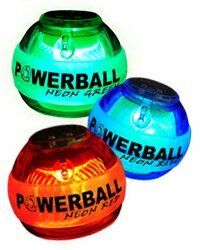 This Powerball is also available for Customization. Dynamic, exquisite, absolutely gorgeous! 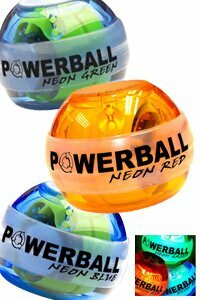 The extraordinary new Powerball Signature with its sapphire white light neon rotor revolving within a subtly smoked shell is truly a design classic and will exceed the very highest expectations of Powerball fans all over the world once they experience its silky smooth movement! Put its rotor in motion and the ball instantly comes alive with Gyroscopic force - a sublime yet pleasant resistance to the movement of your wrist and hand and one which grows in its intensity as the speed of the rotor builds... faster and faster...up to a point where it is thrashing and jerking furiously, literally exploding with inertia and almost impossible to control! This limited edition gyroscope has a top speed in excess of 16,000rpm and can generate over 40lbs of resistance on the hands and arms as it spins (which is quite extraordinary given that it is just the size of a tennis ball and weighs under 300grams!). The new Signature is our Premium Neon Powerball model and is supplied with an exclusive mini DVD providing you with exercise routines, three exciting Powerball film clips, starting tutorials plus the full suite of Akis World Speed records to really spin your mind! The new limited edition Signature...our finest Powerball yet?